In our diamond investment guide, we discuss the 8 various diamond colors out of the 12 total fancy color diamond colors that we consider to be investment grade, mostly due to those colors’ rarity factor. 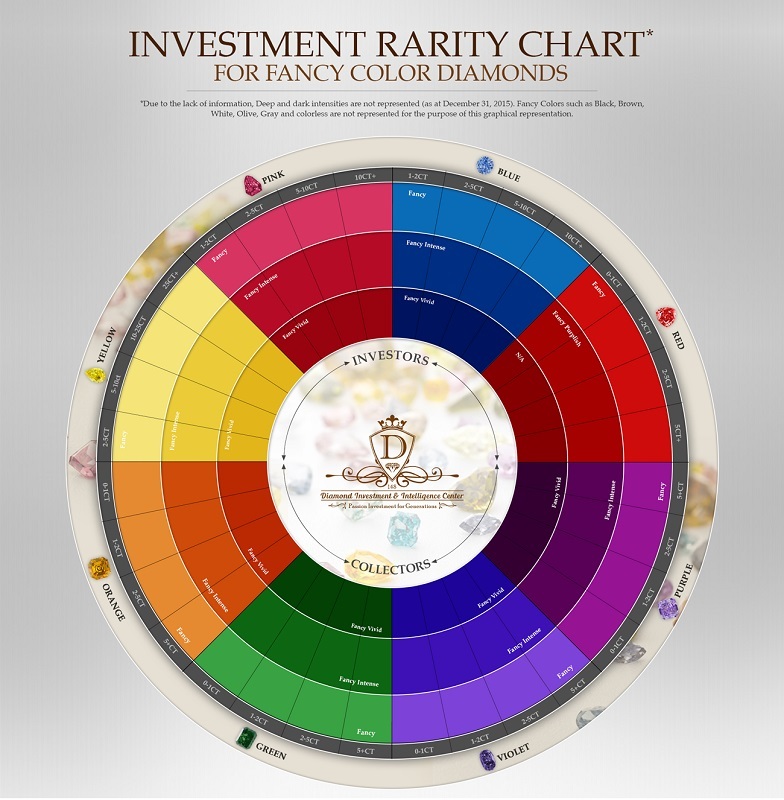 We have divided those 8 colors (red, blue, pink, yellow, green, purple, violet, orange) into 2 groups; diamonds for investment & diamonds for collectors. The main reason behind the split into two groups is the diamonds’ liquidity/valuation. In order to be considered an investment grade diamond, the diamond needs to not only be of a certain level of rarity, but also be characterized by a certain level of liquidity and valuation. A pure purple diamond may be rarer than a pure blue diamond, but if it is not liquid enough (for example, not many sell in auctions), it is a challenge to properly evaluate their financial value and potential ROI. For this simple, yet extremely important reason, purple is in the collections category and not investment. There are only a handful of people in the entire world who can properly evaluate green diamonds, because they transact with these rare fancy green diamonds daily. All the individuals are global diamond traders who trade in the rarest and least common diamonds in the world. As most diamond trading is done in quiet, private transactions, the common investor does not have access to these transactions or their sales prices, but rather they must rely on auction sale prices (the least) and other elements to properly evaluate the financial aspect of a diamond. Green diamonds are particularly demanded in the Asian market, where jewelry auctions are headlined by Jadeite as well as diamonds. Part of the recent growth in green diamonds can be attributed to the record setting prices that green diamonds have earned at auctions in Asia. Simply put, natural Fancy Green Diamonds are formed when colorless diamond geological materials are exposed to natural non-harmful radiation during (but mostly after) the diamond’s formation. 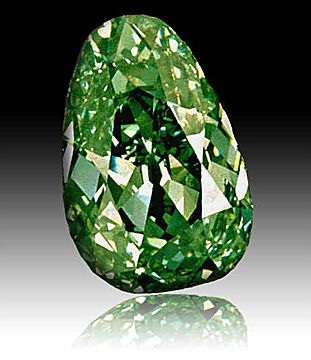 The majority of the green diamonds that are formed in nature also exhibit a secondary color, known as the modifier. The modifying colors can be either yellow, blue or gray. Like the other 7 diamond colors that we placed in the investment and collection categories, green diamonds with a “pure” color and no secondary color are more valuable. Likewise, the more intense the color depth, the higher the diamond value will be. 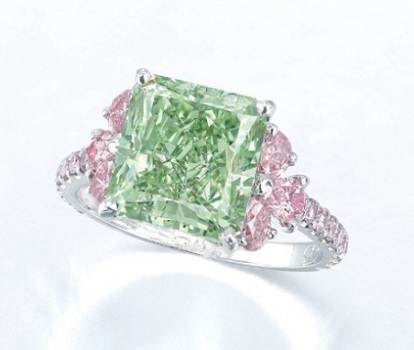 For example, a Fancy Vivid Green diamond is the most expensive and demanded type of green diamond that exists. 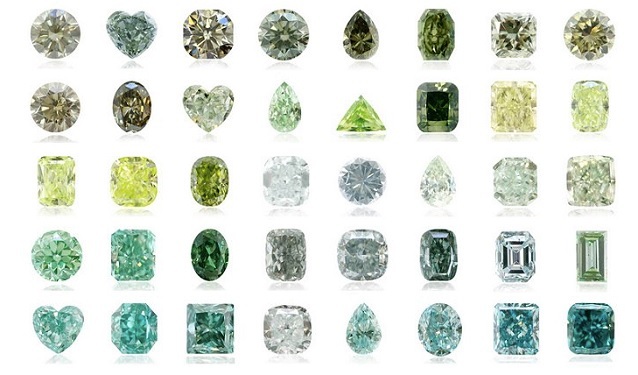 All color combinations of fancy green diamonds in all intensity shades, from left to right: Image credit: Leibish & Co.
A handful of green diamonds have entered the history books. Some are hundreds of years old, and some made history as recent as 2016, but what they have in common is that they are all rare and valuable. The oldest and most famous green diamond is the Dresden Green, a 41 carat Green diamond that is named after Dresden, Germany where it has been displayed for the last 2 centuries. The Dresden Green is the largest and most known green diamond in the world. 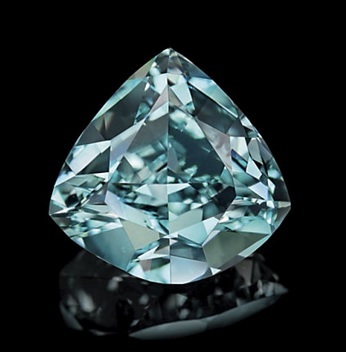 Another very famous green diamond is the Ocean Dream diamond. 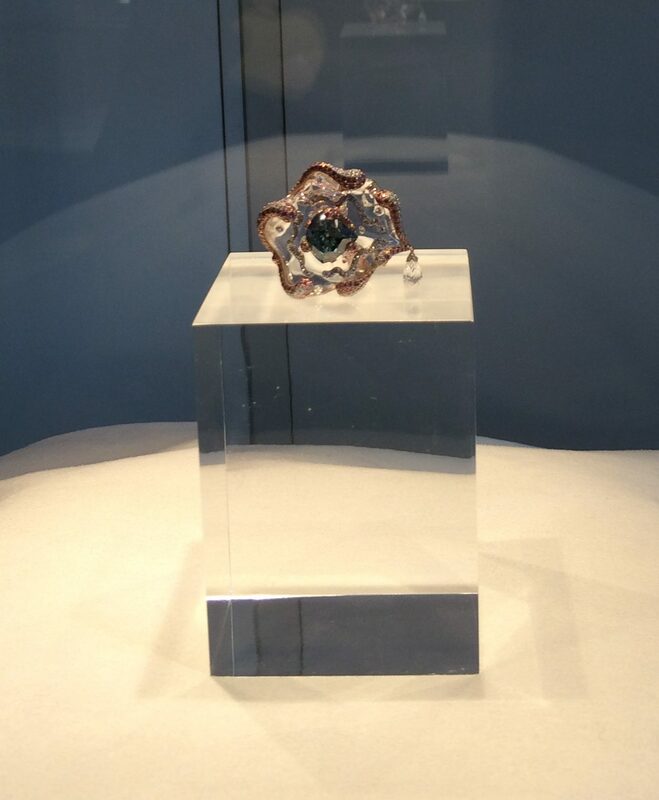 It was exhibited at the Splendor of Diamonds Exhibition in the Smithsonian Museum in Washington, DC. The Ocean Dream is the first and one of the only natural diamonds graded Fancy Blue-Green, and it originated in Central Africa. It sold at auction at Christie’s in May 2014 for $8.45 million by Moussaieff. 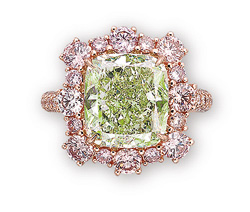 A recently famous green diamond is the 5.03 carat Fancy Vivid Green “Aurora Green” diamond. 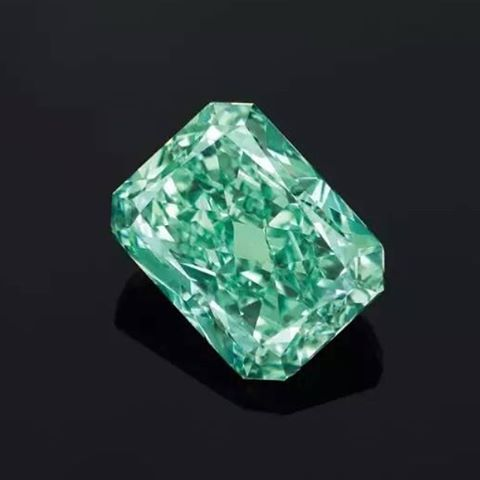 It is now the largest and most expensive Fancy vivid Green diamond to ever sell at auction, at the time of the auction (remember that the Dresden Green has not yet been sold). It was offered by Scarselli Diamonds at auction at Christie’s location in Hong Kong in 2016 where it sold for $16.8 million to Chinese jewelry company Chow Tai Fook. This sale is credited with the recent increase in demand and price for green diamonds. 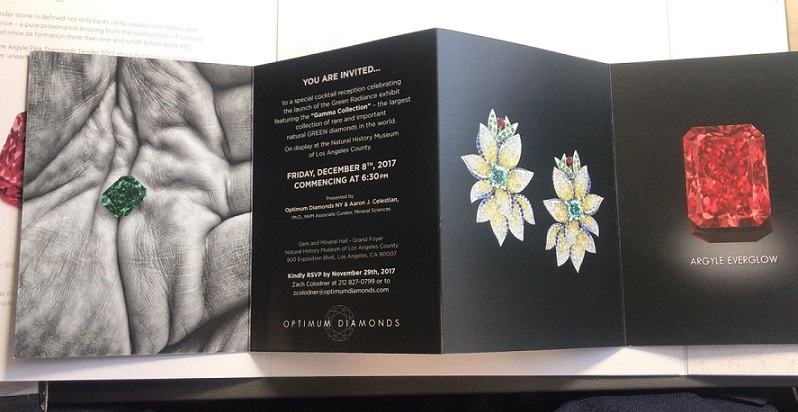 Green diamonds are so rare and so hardly ever seen by the general public that David Shara, founder of New York–based diamond dealer Optimum Diamonds chose to exhibit his carefully cultivated, 60 green diamonds “Gamma Collection” which he painstakingly amassed over two decades. 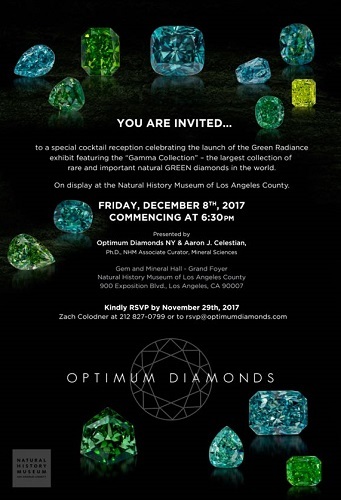 The chosen venue is the Natural History Museum of Los Angeles County and the exhibit is called Green Diamonds: Natural Radiance, where it can be seen in the in the museum’s Gem and Mineral Hall. An Article was written about the exhibition in Robb Report Magazine. The Gamma collection includes both mounted and polished diamonds, and is named after the type of radiation that causes the green color in diamonds. Optimum Diamonds is also known as the diamond company that bought the largest ever red diamond from the Argyle mine. The 2.11 carat Fancy Red “Argyle Everglow” was sold at this year’s Argyle Pink Diamond Tender and set a world record when it earned the highest price ever paid for an Argyle diamond as announced by Rio Tinto, the owner of the Argyle Mine. Argyle diamonds are typically purchased by serious diamond investors, collectors and traders alike, so the high price is a strong indication that Shara is an important figure in the diamond industry. 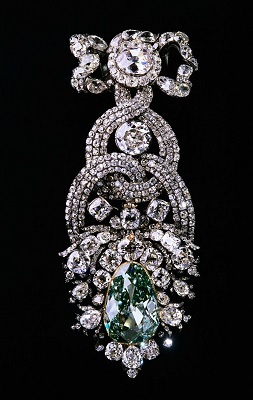 The ultimate goal of the exhibit is to increase awareness and appreciation for high quality green diamonds. Are Green Diamonds for Investment or Collection? 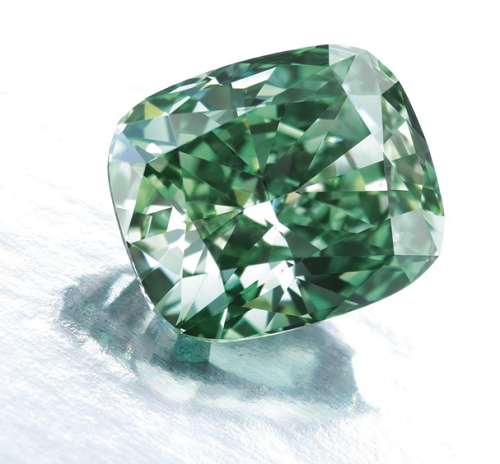 As of today, green diamonds still mostly appeal to collectors more than investors. However, there has been a slow shift in this state as consumers learn more about green diamonds, especially through channels such as the green diamond exhibition in LA. Like with many alternative assets, it takes increased awareness of the investment’s viability in order to truly stimulate growth and demand for it. 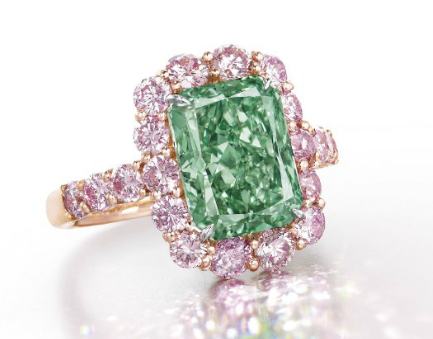 Only in the last few decades has the market truly begun to internalize how rare fancy color diamonds are, and it is slowly becoming understood that green diamonds are an important, rare, and desirable color as much as many other colors are. 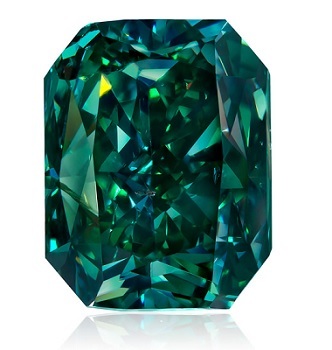 The main green diamond at the exhibit is the 3.88 carat Fancy Vivid Green radiant cut diamond. It is very beautiful and will doubtless stir up interest. Currently, the Aurora Green diamond is the most expensive Fancy Vivid Green diamond in the world. It sold in 2016 for $16,818,983 or $3,337,099 per carat, breaking the previous record for green diamond price which was set by a 2.52 carat Fancy Vivid Green diamond in 2009 when it sold for $1.222 million per carat. Just look how magnificent the 3.88 carat Fancy Vivid Green Looks… it may no longer be the Largest Fancy Vivid Green, but its color surely is still the best…and most likely will attract extremely high price per carat. It may sell privately and break the current record per carat for a Fancy Vivid Green Diamond (as it should), but we will never know. Please note that I am not compensated to write this, but was amazed when I saw it myself in New York almost 2 years ago. The prices and demand for Fancy Intense Green diamonds is significantly lower than for their Fancy Vivid Green counterparts, although their prices are still very strong. A 6.13 carat Fancy Intense Green diamond was sold on May 27, 2014 by Christie’s for $594k per carat. In June 2015, 5.02 carat Fancy Intense Green diamond with SI1 clarity sold for $2,701,056 or $538,058.96 per carat. These are the two most expensive Fancy Intense Green diamonds in both total price and price per carat. By comparison, common colors of fancy color diamonds like yellow sell for far less per carat at this color intensity and carat weight range. Until recent years, diamond dealers would have answered that fancy green diamonds are more suited to collectors rather than investors. However, with the increase in fancy color diamond awareness and their value potential, all the colors of fancy color diamonds have experienced a lift in demand in corresponding price. The significant increase in green diamond prices in the last few years alone is already a strong indication that this color, which was once not relegated to the investment realm, is slowly becoming a serious demand. As knowledge and information about green diamonds proliferates, investors’ desire to invest in green diamonds will grow, which will in turn increase their valuation and ultimately their liquidity. As with all fancy color diamond investments in any of the colors, not all fancy green diamonds could equally be considered an investment. It is best to consult with a diamond investment expert to ensure that the diamond that you are purchasing is of investment quality and not simply a poor-quality diamond of another color with a green overtone, which would not be an investment at all! Diamond investments are a delicate but lucrative field and it is crucial to be guided by an expert to ensure your financial security. Got a question about green diamond investments? Ask us at info@investments.diamonds, or ask in the comments!